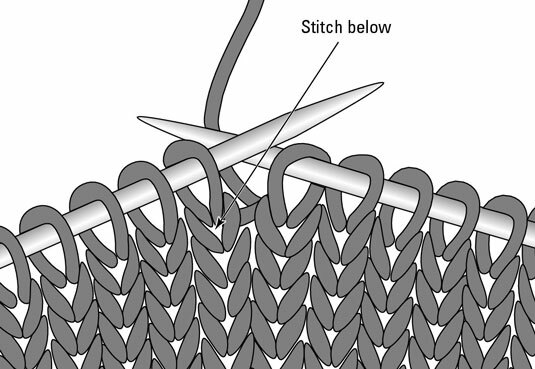 Knitting into the stitch below is a technique used for increasing stitches. Your instructions may tell you to “knit into the stitch below,” often abbreviated k1b or k-b. When you increase a stitch, you add one to your needle, so this technique adds a stitch to the row below the one you’re working on. Insert your needle into the stitch directly below the next stitch on the LH needle. Wrap and knit as you normally would. This is the increase stitch. Knit the stitch on the LH needle. You now have two stitches where one used to be. If you look at the purl side of your work, you’ll see two purl bumps for the stitch you’ve made. You can purl into the stitch below (abbreviated p1b or p-b) by following these steps and adjusting them to purl into the stitch below, rather than knit.